On October 31 2012, two grade eight classes from F.E. Madill Elementary went head to head in an Ultimate Bobbing For Apples Duel. These two classes were, 8A Mr. Westra’s class, and 8B Mrs. Durnin’s class. 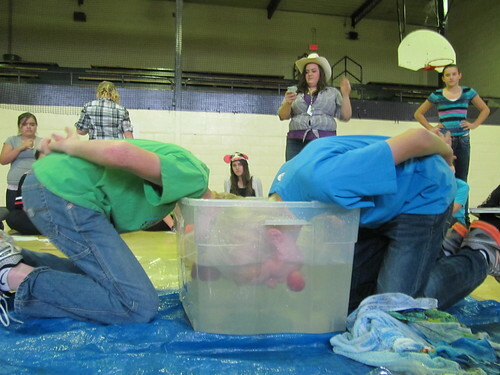 We decided to have this amazing event in the gym on Halloween because bobbing for apples is a Halloween tradition. Also we were learning about collecting data in math, and wanted something fun to do our projects on. So after all of the pairs (one from 8A and one from 8B) competed in the Ultimate BFA Duel, everyone in the two classes created graphs and charts to display the data. We then made connections on our graphs. So the only thing left to decide is, which class won? #9)a) Based on the data in the charts and my graphs, I can make a conclusion that 8B took less time to catch our first apple then 8A. For example, if you look at the “Times To Get First Apples” graph, you can clearly tell that 8B caught most of our apples in 0-20 seconds, while 8A had some of their apples caught in 60-1:20 or 1:20-1:40 seconds. I can also make the conclusion that 8B caught much more apples than 8A. For example if you look at the “Total Number Of Apples Caught In A Minute” graph, you can see that 8B caught more than double the amount of apples than 8A. 8B caught 28 apples, and 8A caught 12 apples. 12×2=24, 28>24. #9)b) Some inferences I can make are that I noticed that 8B had the strategy of pushing the apples over to the edge of the bucket, so then it is easier to grab ahold of them. This must be how we snatched up so many apples in such little time. Also 8B had a way of putting their head upside down in the water, and sliding the apple up the wall of the bucket, until we had it firmly in our mouth. #9)c) The winner of the Ultimate BFA Duel is…8B!!! Of course it was us! To figure out for sure who the winner was, I calculated the mean for “Number Of Apples Caught In A Minute” and “Time To Get First Apple.” I came to the conclusion that the mean for “Number Of Apple Caught In A Minute” was, 4 for 8B, and 1.17 for 8A. Also for “Time To Get First Apple” we came plowing through with a mean of 17.71 for 8B and 33.86 for 8A. Just like Mrs. Durnin predicted, we pummeled 8A! The Idea Hive is a classroom that is built up of approximately sixty students and two teachers that are from two different places in Canada, Snow Lake Manitoba and Wingham Ontario. We communicate with each other by Skype and the internet. In The Idea Hive, you can communicate with different people and learn about each other, that way we can create better social skills. So far this year, I have created an account on The Idea Hive and I have completed a survey so I can get to know the people I will be working with. I have also heard about many things that I will be doing this year, like making my own blog. The idea Hive sounds very interesting, but I still wonder what else can you do there? Something I have in common with most people from Snow Lake is many of us have a pet dog. For example, in Snow Lake, Zach, Katie, Jessica, Alexandra H, and Magenta all have a pet dog. My dog is a rottweiler named Bear. He is very big and muscular, and he loves to play with his rope. But of course, we don’t all have the same breed of dog, and our dogs name’s are not the same! That would be crazy! Something I have in common with only a few people from Snow Lake is our favourite book is The Hunger Games. In Snow Lake, only Tayla and Mercedes said that their favourite book is The Hunger Games. Which I think is different from here, since lots of people in Ontario love The Hunger Games, because it is a dystopian story of love, action and hope all wrapped up in one amazing book. But maybe In Snow Lake they have different tastes in books! Something that is unique about me is that I am the only person that said their favourite show is Toddlers And Tiaras. It is a very cute show about toddlers that do beauty pageants. I particularly like the parts in the pageants, when the little toddlers get up on stage to perform. They are so brave, and they do so well with their routines! I guess practice makes perfect! The person that is most like me from Snow Lake is Taelor K. For example, we both enjoy art and math at school and we both want to get good grades this year. Also, Taelor likes spaghetti and I like pasta (which are pretty much the same thing). 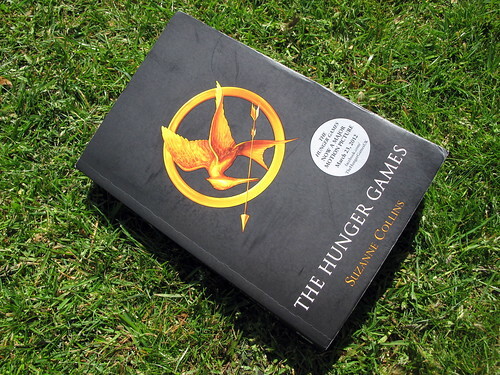 Finally, The Hunger Games is Taelor’s favourite movie and it is my favourite book. I wonder if Taelor has ever ridden a horse before? I’m an 8B Mustang from F.E. Madil.